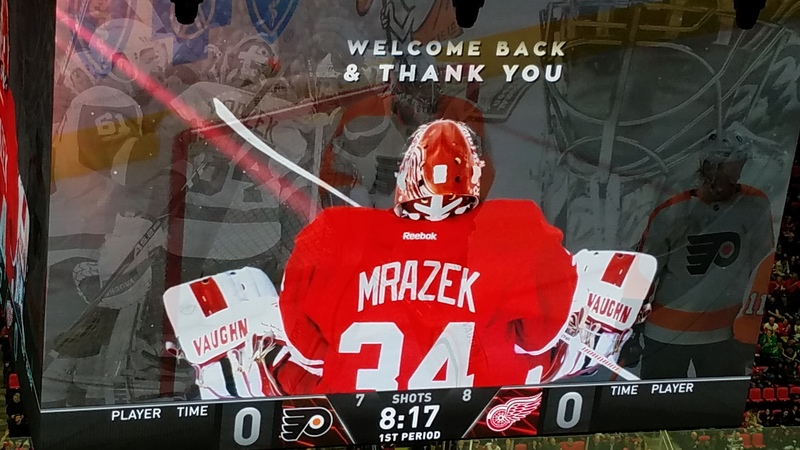 The Red Wings welcomed Petr Mrazek back to Detroit in his first game against his old team. Now a member of the Philadelphia Flyers, his return was spoiled, as he allowed 3 goals on 19 shots, all in the second period. In his first three games in Philly, Mrazek won each, allowing only four goals against (including a shutout). However, in the following 8 games, he had won only two. His save-percentage for the month of March is .867, similar to his .865 mark for the month of December, in which he played only three times. Five times he has allowed four or more goals in the new uniform. The first period was a scoreless draw, but this gave way to a high scoring second and third. 6:08 into the second period, Darren Helm sent Dylan Larkin flying down the wing with a great pass, of which Larkin snapped past Mrazek on the far side. At the 7:59 mark, Luke Glendening, while killing a penalty, led a rush down ice. When his linemate left for a change, he decided to just put the puck on net. Due to poor coverage by Mrazek, the shot found the top corner on the near side, and Detroit led 2-0. It was not a good goal for Mrazek to allow. Philly stormed back to tie it on the same power play, making it 2-1, as Sean Couturier scored from Claude Giroux and Shayne Gostisbehere. Shortly after, Detroit chased Mrazek, as Russian forward Evgeny Svechnikov scored his first career NHL goal, with an assist from his Griffins linemate Martin Frk. The one-timer from close distance rocketed past the netminder on the 19th shot for the Wings. Alex Lyon replaced him in the crease. In the third period, Philly stormed back, scoring twice in the first ten minutes to tie the game at 3-3. First it was Matt Read, who deflected a low shot from Scott Laughton past goalie Jimmy Howard. Next, Gostisbehere scored a power play goal just before the midway mark to even the score. Shots were nearly even at this point (Detroit had led significantly for the majority of the game). With just under six minutes to play in the third, Larkin scored his second of the game to pull the Wings ahead 4-3. In the 3-on-3 overtime that followed (3-on-4 as Danny DeKeyser’s late penalty had 1:26 remaining at the start), chances were traded back and forth to no avail. Detroit’s Luke Glendening blocked a shot with his foot and left the ice in considerable agony while still shorthanded. Lyon made an incredible save to rob Danny DeKeyser shortly after, as the puck was passed from the corner to the slot. Later, Howard had a huge save of his own, robbing Claude Giroux with the right pad. Then, Anthony Mantha had the game on his stick after receiving a pass from Andreas Athanasiou, but as the Red Wings have done all season, he passed it back toward double-A, and it was easily intercepted by the goalie along the goal line. In the shootout, Frans Nielsen was the only goal scorer, as he lightly shot the puck between the legs of Lyon.